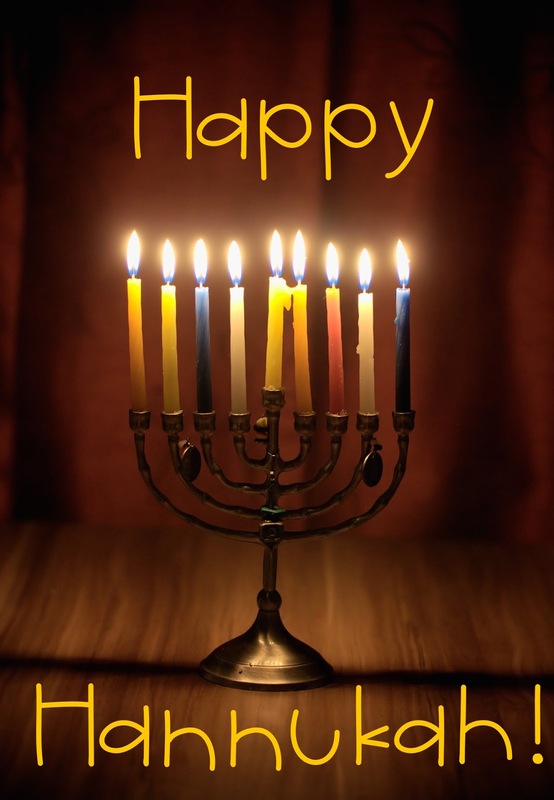 Celebrations at this time of year warm our souls and help us get through the darkness and the cold weather. 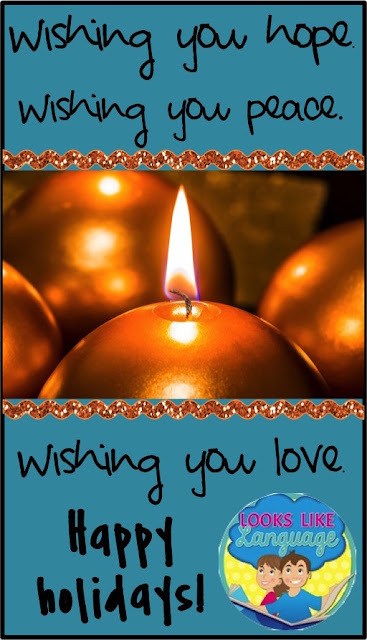 Just think about what the holidays at this time of year have in common- candles, lights, love and family. In a world that is sadly becoming more divisive, it is more important than ever that we, as educators, emphasize the commonalities that all people share, and the goodness that we are capable of displaying. Wishing you peace, happiness and the love of near and dear ones at this holiday season, whatever you celebrate! 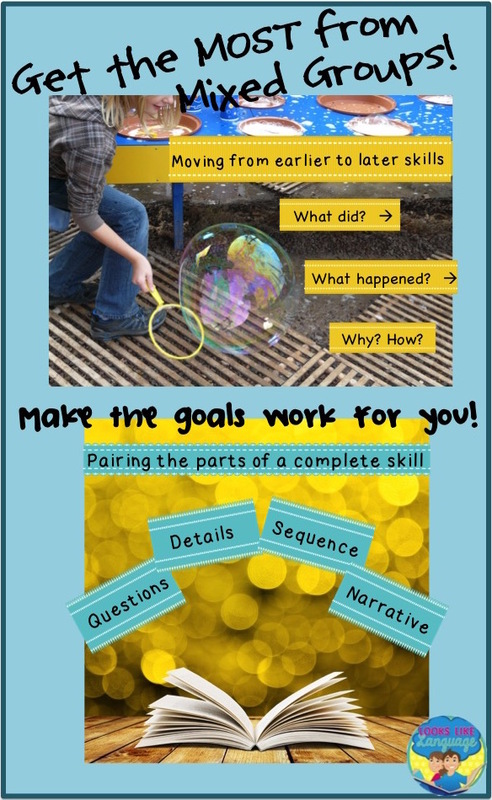 So much goes on in mixed group sessions that sometimes it can feel like a juggling act, especially for new SLPs. The activity, the materials, the behavior, modeling and eliciting the skills, taking data, and watching the clock to get it all completed! How do we get it done? Part of what helps me out is the organization I set up at the beginning of the year, which provides a firm foundation. Don’t worry if you are already into the school year as the ideas will still help you out! Check out this post. Once you have a master sheet of the goals you need to address during the year, think about how they can be worked on together to form your groups. While homogenous groups sound great, it is rare to have them, in my experience, and over time I have come to believe that students benefit from interactions with peers at different levels. It takes a bit of brainstorming to figure out specific activities and goal combinations at first, but soon it will be easier to do! For example, figuring out what happens when (predicting) is an early cause-effect type of skill that students need to make the connection and answer ‘why’ and ‘how’ questions. When you ask your first student, “What happened when I …?” you are providing a model for the student who will be asked ‘Why?” or “How?’ next. SLP: What did I do? Student 1: You moved it. SLP: What happened when I moved the wand? Student 2: You made a bubble. SLP: Yes! I moved the wand and made a bubble. Student 3, how did I get the bubble to come out? Student 3: You moved it. With older students, you can elicit information in turns the same way. 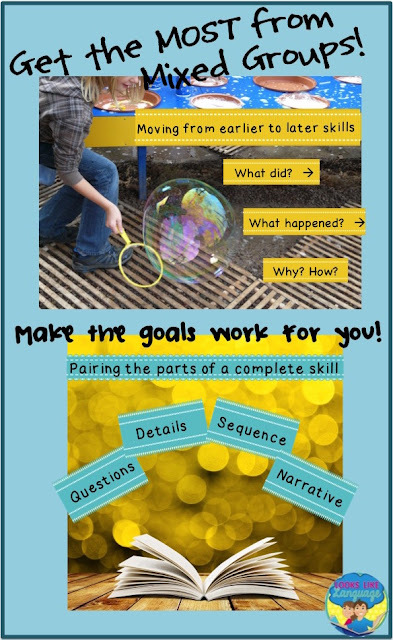 Take the example of remembering story details combined with sequencing and telling the main idea. After a short story or video clip, the first student could use story elements to remember different details. The second student could tell the important story attempts in sequence, while the third could sum it all up with the main idea. This way, the students are interacting and providing some of the information needed, freeing you up to take data. Students who have good language skills but need to work on carryover of their articulation goals can make great partners for students with language problems. The variety of activities you are using, especially books, for language needs can provide many chances for the artic student to use their speech sounds. Make a set of the WH question words that your language student needs to answer and let your artic student ask a question that has one of the target sound words in it as well. Sometimes students respond well to the creative questions their peers ask! Once the students have started interacting with each other, they are both practicing their skills in a more naturalistic way, which is great for carryover. The basic idea behind of all these tips are to have some of the students supply a piece of the information that will provide models or help out the next student, limiting the amount of separate directions and models you have to provide. Using this strategy gets students interacting and using their skills in a more natural way while freeing up a little of your concentration to take data and manage the activity. When it works, it can be awesome! Good luck! It's That Time of Year! Happy Holidays! Gifts are so much fun! 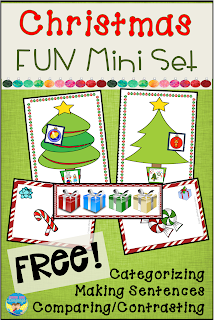 I have updated the December freebie and I hope you will like it! Click here to go to the free download! 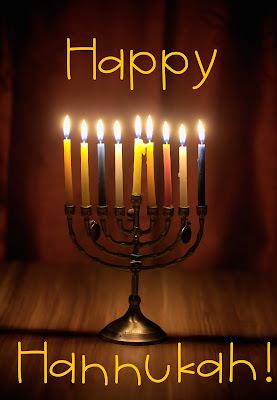 Whatever holiday you celebrate, I wish you a happy one! 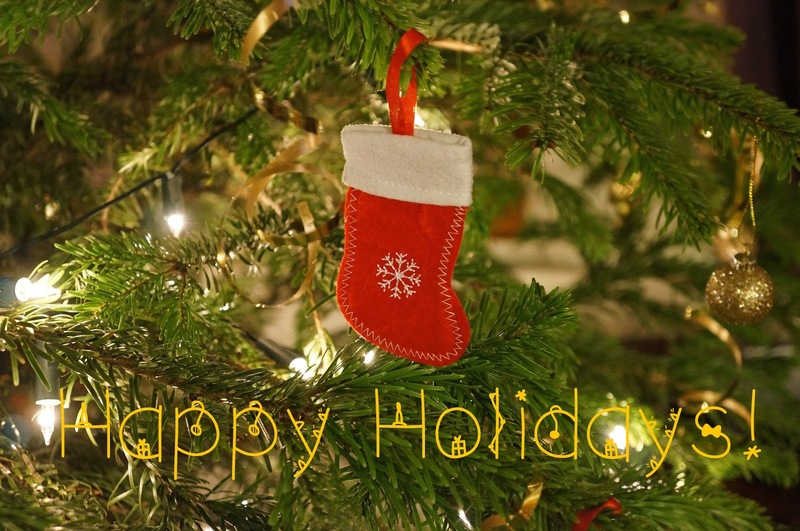 Are your holiday preparations and celebrations going well? It seems like there is never enough time for everything you'd like to do this time of year. I accomplished one thing I wanted to do! A year's worth of freebies! You can get the updated version here. Wish I could provide a time turner for all of us this month! Happy holidays! 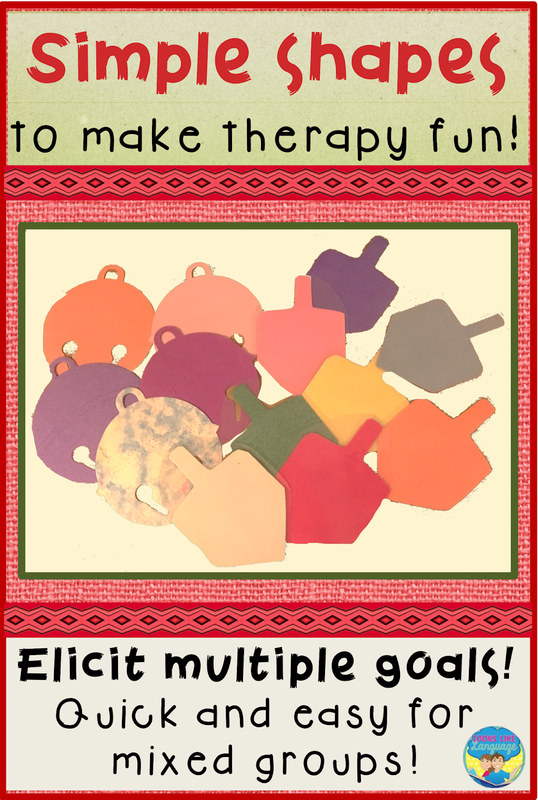 Fun and Simple Holiday Games to Make Therapy So Easy! Life can be complicated, but therapy doesn’t always have to be that way! As a matter of fact, it is just when your life is getting complicated that you really need those quick and easy therapy ideas! 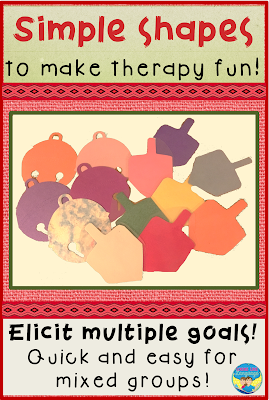 Last year, I posted some ideas for decorating a tree as a quick, fun therapy activity. If you missed that post, check it out here! 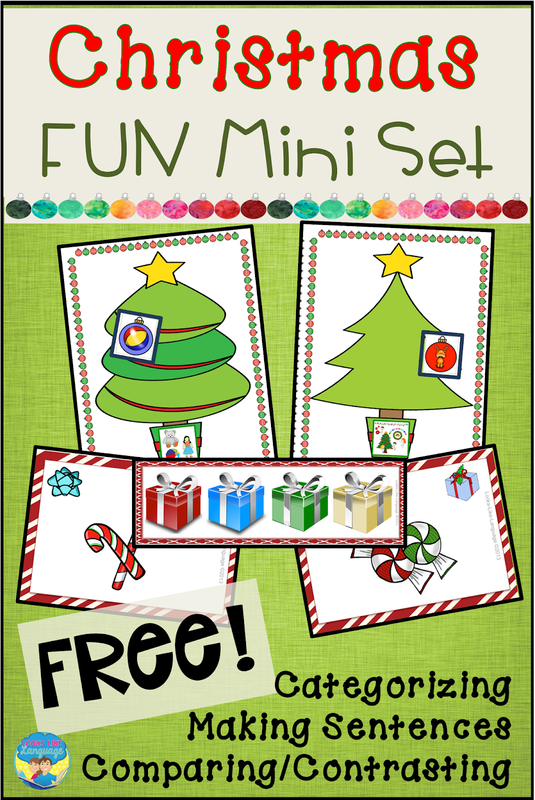 Here’s another way to use simple shapes for open-ended holiday fun. Cut out shapes in different colors, like I did in the picture, but use as many different holiday items as you have available. 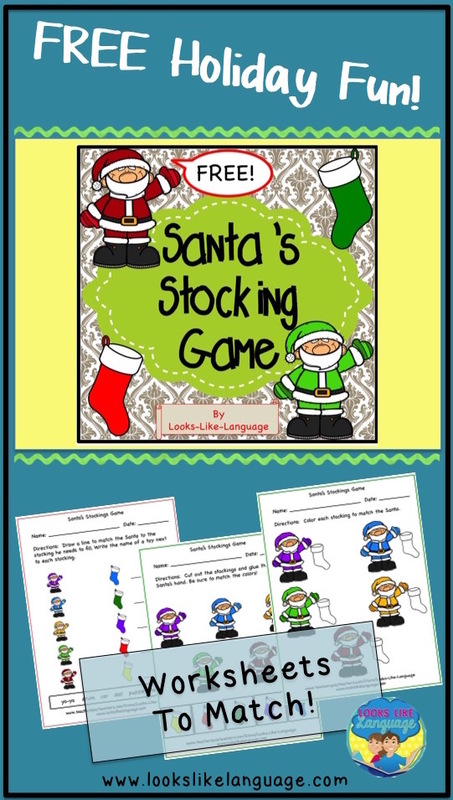 Mix and match holidays and add core vocabulary items, too. I always combined holiday items (for fun!) with teaching toy labels and associated vocabulary, taking data on that rather than the fun stuff I added in. Kids have their minds on presents and toys this month, so the topic is self-motivating and great for home carryover! To play, the students can request the color item that they like. If you need to elicit longer utterances, try adding the same shapes in different sizes. 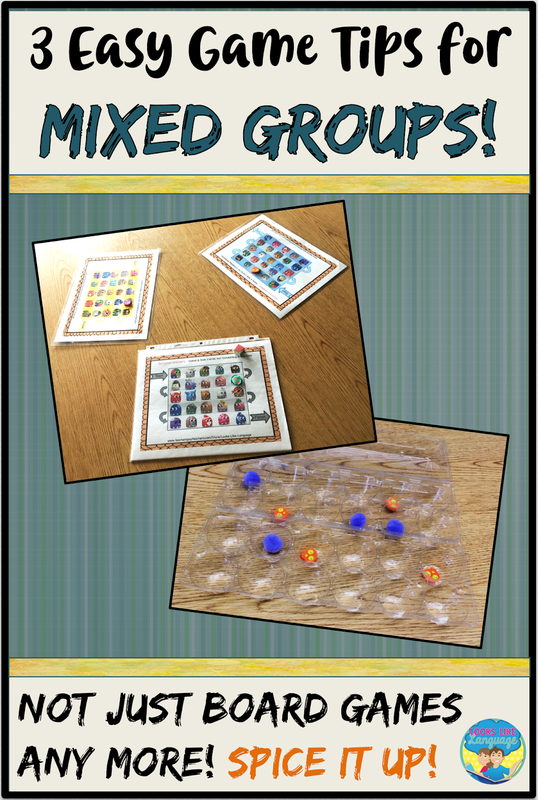 Or, instead of placing them in a pile, lay them out like a memory game and have your students request the orange ornament that is below the blue dreidel! Tape pictures of their target words on the back and have them say it correctly to keep the shape or put pictures of holiday activities on the back to elicit grammatical structures. Besides simplicity, one of the things that I like best about these activities is that it lets you incorporate seasonal vocabulary with your students, yet not make it the main focus of your therapy session. Teachers, moms, and dads will be using those seasonal words with them, too, so don’t lose track of the special skills we have to offer and what we can work on that the students aren’t getting help with anywhere else! The versatility of these open-ended games makes it easy to use from year to year as well. So, last year you worked on beginning sounds and this year you have a lot of final consonant deletions? No problem! Just pull off the pictures from last year and tape a new picture on! Having a super busy year? Are you looking for a versatile game where someone else did the work for you? I’ve got that covered, too! Check this freebie out! Easy peasy activities that provide perfectly fun, adaptable ideas for this time of year! Freebie Fun and A Truth Revealed! This week has been so much fun! Although the work week is almost done and we can say, "TGIF!" you still have chances today and tomorrow to win a freebie of your choice (no bundles, please) from my store. To earn your chance today, be sure to comment below with what kind of product you most wish for, if you could have one personally designed for you. Who knows, maybe you will see it sometime in the future! One of the reasons this week has been so much fun for me is the chance I have gotten to interact with you, either here, on Fb or on IG. My truth revealed? Well, you know from my bio that I have been an SLP for quite a while, which means that many of the skills I'm using now to publish were ones that required a lot of hard work (and advice from my kids) to learn. The first time I learned about blogging was when I watched that movie about the woman who cooked Julia Child's recipes and blogged about it for a year. I left that movie saying that I would never write a blog. You know, the things you say that come back to haunt you later? My husband is the reason I changed my mind and stepped out of my comfort zone. He has always been a staunch supporter of my SLP skills, even when supervisors thought that I was stepping beyond the boundaries of our field. He encouraged me to share my experiences with SLPs so that kids could benefit, instead of keeping my experiences to myself. So, here I am! I hope that you will find something helpful to you in my posts. I am so very grateful to have gotten to interact with you this week, taking the edge off of wondering who was out there reading this! I'm glad you joined me! Comment away with your perfect item to solve an SLP problem and good luck winning the contest today! This season manages to be the busiest, as well as the darkest, time of year, so there's nothing like a little freebie to make your life a little brighter! I gave you the complete set of game cards last week so you would have plenty of time to use it. If you missed that post, click here! 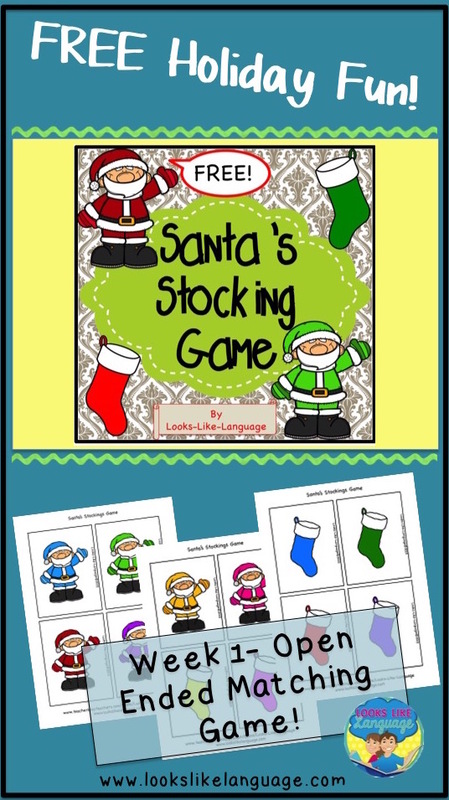 This week's free download is a matching worksheet. Enjoy! 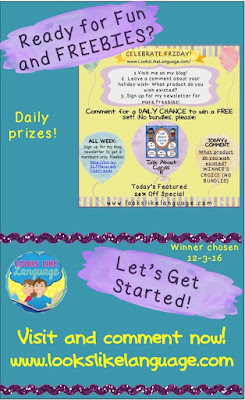 Have a Fun FREEBIE Filled Week Here! Welcome! I‘m so excited to the Featured Seller on the SLP Materials Club this week! If you don’t know about this group, you should! 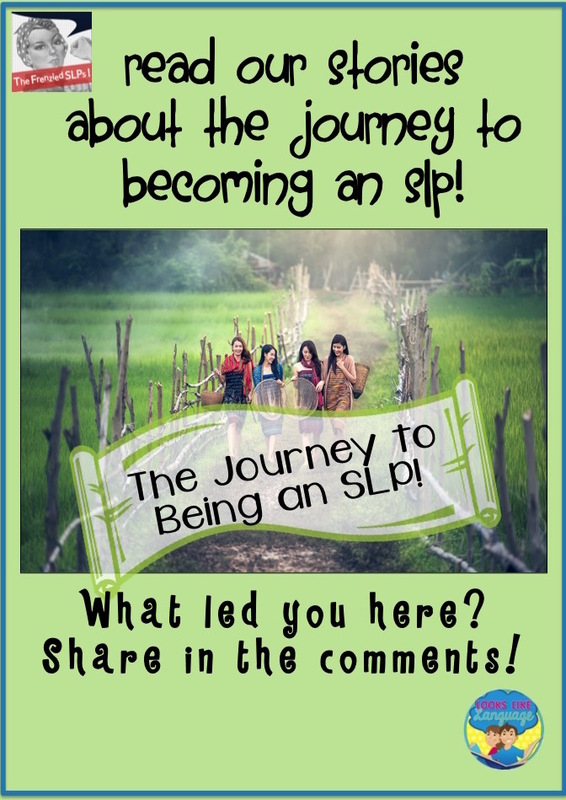 Every week, a new SLP seller is featured, with a freebie and sometimes chances to win prizes or sales! If you haven’t already joined, link up here! This week, I will be offering daily sales, chances for a free product of your choice (no bundles) and a freebie for ALL of my newsletter followers. 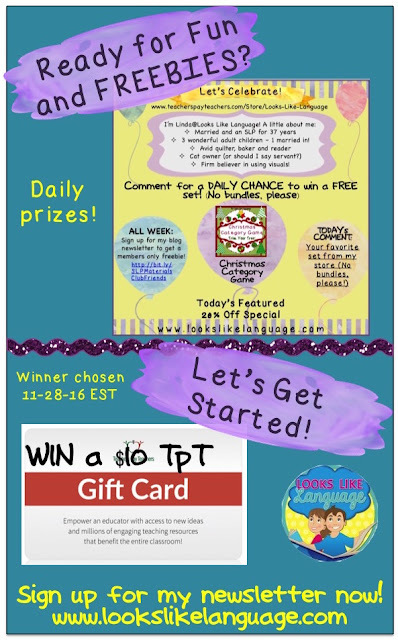 I am super happy to also have a $10 TPT GIFT CARD to give away! The winner will be chosen on Monday at 5:00 PM EST so you can use it during the sale. To get a chance to win the gift card, just sign up for my newsletter and comment below! SO, be sure to SIGN UP NOW! Just fill your email address and first name in the bar at the top of my blog, then comment below! The winner will be announced here and on my FB page tomorrow. 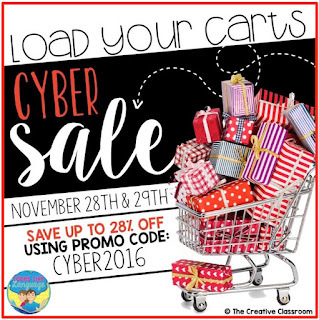 As if there isn’t enough going on, it is also the TpT Site Wide Sale! You can get 28% off on all items in my store, with extra discounts on my featured items for this week! Check it out here! Thanks to The Creative Classroom! Shopping the site wide sales is thrilling, but can also be a bit overwhelming, too. To help you out, I’d like to feature my Speech Spotlight blogging friends and the types of terrific materials you can find at their stores. 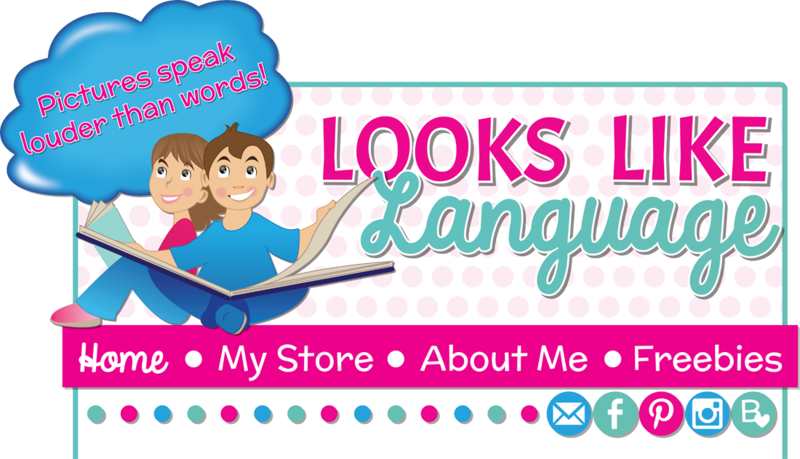 For VISUALLY SUPPORTED MATERIALS for autism, special needs and at risk learners of all ages, visit Looks Like Language! 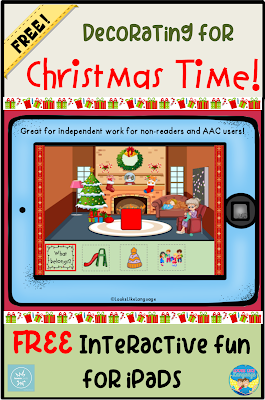 Looking for AAC MATERIALS and LITERACY supports? Susan Berkowitz is the place to go! NO PREP language and articulation fun, including dice games for elementary students, can be found at Ashley Rossi’s store. Jennifer Bradley loves articulation and features NO PREP and NO PRINT materials! Collette from Alberta Speechie has preschool to 2nd grade materials that are ADAPTABLE to grow with the student or to meet the needs of your groups. 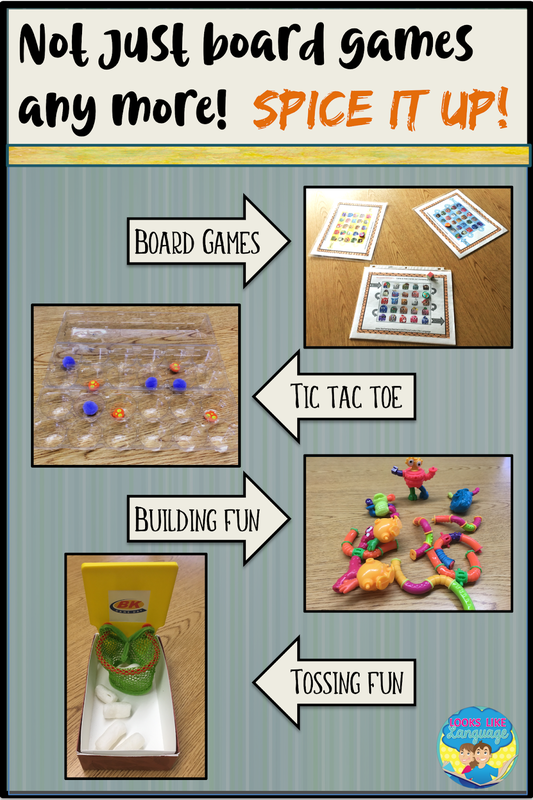 Lisette at Speech Sprouts has your PRESCHOOL - 4th grade needs met with a wide variety of activities in each product to use across your caseload. Engaging, EVIDENCE BASED products for autism, special education, and functional skills students in K-8 are the focus of Anne's Beautiful Speech Life! Tami from TLC Talk Shop provides engaging and INTERACTIVE speech and language materials for Pre-K to 5th grade. Need BILINGUAL SPANISH materials? Sarah Wu- Speech is Beautiful has you covered! Pediatric private practice is the new focus for AGB Speech Therapy! Find PARENT HANDOUTS here! 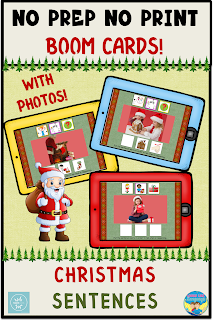 Whatever you need, I’m sure you can find a great material to use from one of the SLPs on TpT! Have fun during my FEATURED SELLER week! There are daily prizes, so you have a good chance of winning if you play all week long! Did you sign up for my newsletter on the top bar? Then comment below for your chance to win a $10 TpT gift certificate! Good luck! Labels: Freebie Alert, SLP Tips, TpT Sale! It's That Time of Year- A Gift for You! It's that time of year again! I can't believe it! 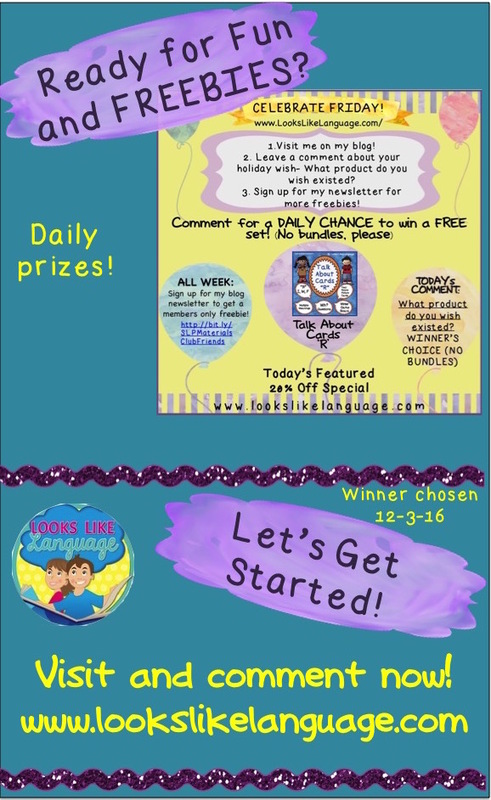 Last year this time I had just agreed to join ClassroomFreebiesToo and was wondering how in the world I would manage a freebie a week for a year! Well, I accomplished it! Hurray! 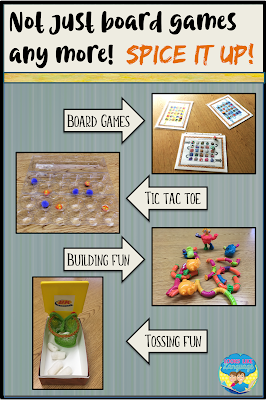 Since I missed my years of working with preschoolers, I was motivated to make some simple, fun games that worked on basic readiness skills that would help both parents and educators. I hope you've been loving them! I also hope that you will join me for my monthly newsletter. If you do, there will be no spam, just tips, news and freebies! I hope to see you there. Just fill out your email on the top bar to stay in touch! Click here to download the matching game. Newsletter friends, enjoy your extra pages! Quick, Easy and FREE Thanksgiving Play Tips! One of my favorite categories to use along with the Thanksgiving theme is (you guessed it!) FOOD. What a natural go-together! The basic Thanksgiving vocabulary, such as Pilgrim, Indian, log cabin, teepee, etc. can be incorporated into play based on daily routines, while actually building your little ones’ communication skills for food names, eating and drinking! Watch out for craft store sales to get great little props. The Pilgrims and Indians in my photo are wooden pieces that I think were meant for scrapbooking or decorating frames! Of course, raiding your children’s toys (if you are brave) or checking garage sales are other ways to get great finds. Best of all, the log cabin and teepee will cost you next to nothing! Did you figure out how they are made? For the log cabin, I cut out around the opening for the tissues, leaving about a half inch of the box left to provide a sturdy frame. Glue the log cabin photo onto one side of the box and cut out the tissue box and the photo around the door frame. Bend it back so it can open and close. Add extra construction paper logs around the other sides if you’d like more detail. For the teepee, cut along the length of the toilet paper roll to open it. Pull one set of ends together in a way to get the other ends opening up in a teepee shape. Glue or tape the skinny ends together and secure with a paper clip. Glue the teepee photo onto the toilet paper roll, aligning the openings, and cut the toilet paper roll opening to match your photo. If you don’t have play figures, cut out Pilgrim and Indian finger puppets, and small pictures of the foods or target words you need to elicit and you are ready to go! 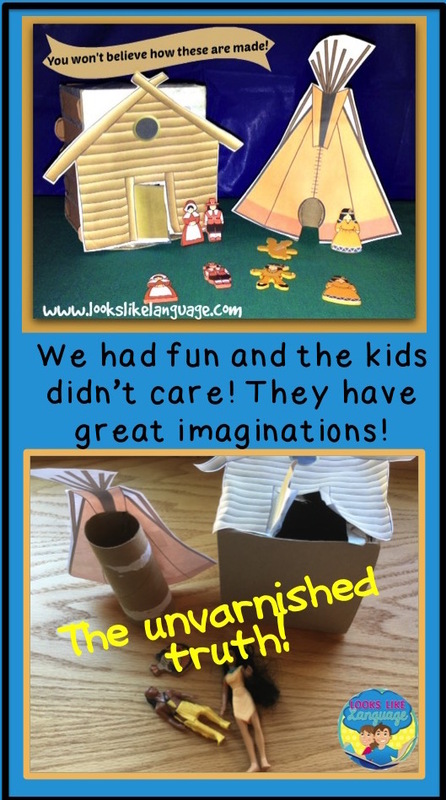 Then, they can talk about who is hungry or thirsty, what food each person wants, how are they going to get it (catch the turkey, grow the pumpkin, shuck the corn) and where it goes (in the teepee or in the log cabin.) For even more fun, have your students make food from playdoh. There’s no worries about messing up the play houses since they are so easy and inexpensive to do! But, if they do survive the play, you can store all of the picture cards, finger puppets and other play items in the tissue box until next year! How did you decide to become an SLP? I’m joining with The Frenzied SLPs to tell you our stories of what led us to this path in life. I’m sure that there are as many different stories as there are SLPs! My interest in speech therapy started at a very young age. I was in elementary school when I had a young cousin who was unintelligible to everyone in my extended family, except for my aunt and I! It got me thinking that maybe I had a special skill. Time passed, and I remained interested in working with children. I ran a small summer camp for local kids with a friend, babysat and volunteered my time with disabled children while in middle/high school. However, I entered my undergraduate years planning to become a reading specialist, combining my love of books and children. Then I realized that there was no undergraduate major for reading, at the same time that I was highly recommended to take an introductory course on speech and language development. I was fascinated with all of the information that I learned that semester, and my major was decided! Being an overachiever, I took quite a few education classes and double majored in psychology, as well. When it came time for a Master’s degree, I decided to continue with speech/language pathology. I’m very glad that I did! I must say that, in my long career, at times I have felt swamped with too much to do and overwhelmed with paper work, but I have never been bored! Each student I have worked with has had me learning as much as I was remediating! Every child is unique, learning in a different way and bringing their individual strengths and weaknesses to the learning curve. From infants to high school and regular education to special needs, I’ve had the privilege to touch many lives for the better! What is your story? Please share in the comments! If your school is like mine, you have a few days to get through before Thanksgiving! Why these short weeks before a holiday sometimes seem the longest is beyond me! To say Happy Thanksgiving to my loyal followers, I'm getting this last section of my Thanksgiving out to you ahead of time. I really hope it makes your planning a little easier this week. Download it here, and have a wonderful holiday! I just love using visuals! They really help any students with processing or learning problems, they support at risk learners, and pictures just make it more fun for kids! I do tend to forget how much more easily most students will write than mine will, but don't be concerned. Your students who learn at a faster rate will have fun with the pictures and then can go write their own sentences after! 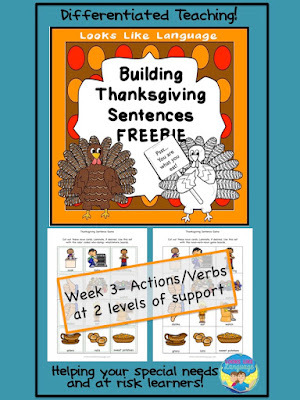 Building Thanksgiving Sentences has picture supports at two levels- supporting comprehension using color coded WH questions and noun-verb-noun sorting for higher level students. Fun for everyone! This week you get the action/ verb pictures for making sentences. Download it here! 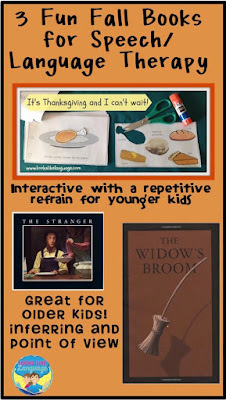 3 Fun Fall Books From Interactive to Social! Books are the best therapy tool! Beside the fact that our kids need more exposure to reading, a book provides a great way to work on a variety of goals with a central activity to tie a group together. When I worked in preschool, I often used simple repetitive books. Children love that they can ‘read’ by repeating the refrain, and truly, it is a way to teach children to begin to read. *typical speech skills student will get lots of practice with a repetitive refrain that incorporates their target sounds! Mostly, I love them because I love books! 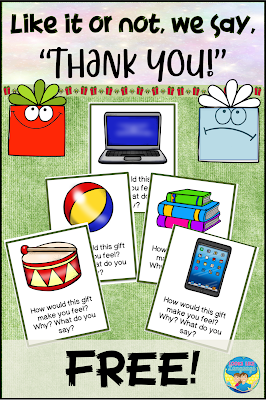 What a wonderful gift we are giving to students if we help them learn to love books, too! 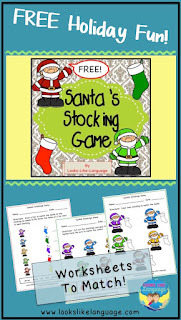 The pictured interactive book can be found here. Since I’ve been working with older, lower level students, I am always on the lookout for picture books that are not too babyish. My favorite finds allow me to work on inferring skills, problem solving and have multiple characters and perspectives to work on social skills, too! I wish I could tell you that I have found the perfect book for Thanksgiving, but I am still on a search. However, I have 2 great books for fall that I successfully used this year. I started the year off with “The Stranger” by Chris Van Allsburg. This is a great book for making inferences, and I love the illustrations. While the book is simple enough to use with my lower level older students, the illustrations keep it from looking babyish. I think it is important to use actual books, when possible, to get students looking back at the text to find the important details, whether they are answering factual questions or making inferences. After reading the book, though, I loved using this YouTube video as a follow up. It is a well acted movie version of the book that gave my students practice in interpreting facial expressions and body language. It also let me elicit language for comparing and contrasting the video version with the book, and my students love almost anything when it is on a computer! Since I was encouraged by this success, I moved on to another Chris Van Allsburg book: The Widow’s Broom. I loved using this book for some different reasons. My students who are working on narrative skills got practice retelling the beginning of the book from two different character’s points of view. I had them retell the story as if they were telling a friend abut what happened, getting them to take the perspective of each character. Even better, it is great for working on theory of mind. Will your students realize that the widow has no idea about the witch’s activities that night since she was sound asleep? The book continues with opportunities to discuss the varied point of view about the broom. Is it wonderful or evil? I’m sorry to say that I did not find a video production for it, however, but it is a great book! Try them out! Wishing you and your family a warm, wonderful Thanksgiving with much to be thankful for!